This is a guest post from Michael Robertson, a 12-year veteran of the digital music business. 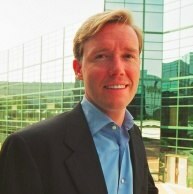 He is the founder and former CEO of digital music pioneer MP3.com. He is currently the CEO of music locker company MP3tunes. Until recently he was an adviser to Google Voice following the acquisition of Gizmo5. Pandora is the widely popular web radio service. Publicly they have said that they turned the corner to profitability in the 4th quarter of 2009. 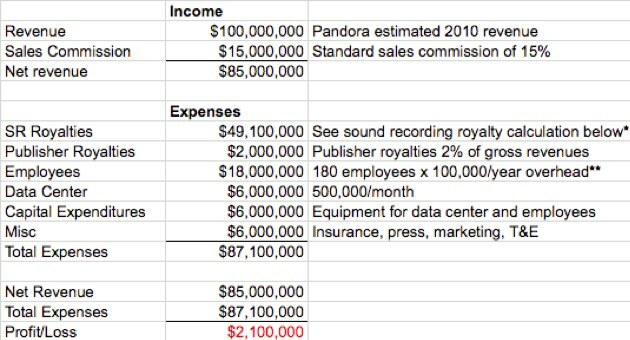 Below I forecast the 2010 numbers for Pandora using information from Pandora, music royalty rates that all webcasters are obligated to pay, and standard expenses of running a California based technology start-up. With tight management of operating estimates Pandora is going to be close to breakeven in 2010. If they can more than double revenues they could operate break-even or even very slightly in the black. The largest impact to their financial situation is music royalties which takes a majority of their revenues. In 2009, Pandora paid $30,000,000 in royalties or about 60% of their total revenue. This year the royalty obligation will be substantially higher because they are required to pay a fee every time they play a song to a user. It’s not just a flat percentage of their revenue or a preset amount. As their userbase grows their royalties obligation grow proportionally which is why in spite of doubling their revenue from 2009 to 2010 which is a notable accomplishment for a company with revenue of their size, they are not moving to clear profitability. The per user royalty rates Pandora has agreed to pay will go up 10% per year for the next 4 years. This is the per song rate or what they must pay every time a song is played for an individual user. A highly illogical aspect of radio is that there exists a ‘spectrum bias’. Depending on the spectrum of the radio wave transmitting the song to the listener, the royalty payment can vary widely from zero to a huge number. If the song is transmitted over 30–300 MHz (FM radio) then the royalty rate is zero. For songs transmitted over 2,332.50-2,345.00 MHz (satellite radio like XM) operators are required to pay 15% of total revenues, but for those operating in internet frequencies 2.4 GHz or 5 GHz (wifi) or cellular phone the royalty structure can be 50-60% of total revenues as evident from Pandora’s analysis. Astonishingly in spite of this enormous current inequity, SoundExchange (which represents record labels) has asked the Copyright Royalty Board to more than double the rates for 2011-2015 for webcasters over what Pandora is currently paying. This won’t immediately affect Pandora since they have locked in rates that rise 10% each year over that time period, but after that period they will be susceptible to future rate increases. Most internet companies operate more efficiently as they grow. They take advantage of economies of scale (increased buying power) as they get large. Plus they benefit from cheaper computing, bandwidth and storage. Pandora should experience these benefits in their technology related costs. However those costs will not materially impact the economics of their business since the royalties are so substantial. Pandora has savvy management. They’ve been in this business for about a decade and raised close to $100 million. I don’t believe the economic realities escape them. In fact, they have asked Congress to implement “rate parity”. This would mean old fashioned radio, satellite radio and web radio would all have to pay the same royalty rate. The intention in such a reassessment process would be to remove the spectrum bias and create parity radio over any spectrum would pay the same royalty. From a business standpoint Pandora has many positive attributes. They have 50 million registered users. Their brand is well recognized and regarded. Their service is universally praised as easy to use, satisfying and they’re rewarded with significant usage. They will do billions of minutes of music in 2010. But for each minute the expense odometer turns. Pandora must devise a way to lower this royalty amount if they’re to build a long standing profitable company. * Royalty calculation: Pandora must pay 0.097 cents in 2010 every time any portion of a song is played (even if you only listen to a short part of the song). See: michaelrobertson.com for an in depth analysis of rate structure. Pandora does not disclose the number of songs they transmit. However, in 2009, Pandora stated they paid $28 million in music royalties. In 2009 their per song royalty rate was .093 cents per song which imputes that Pandora transmitted 29.8 billions songs. If one assumes 70% year over year growth in 2010 Pandora will play 50.66 billion which would require them to pay a sound recording royalty of $49.1 million. ** Employee calculation: Pandora has 12 offices and 180 employee, 80 of which are sales people. An estimate of $100,000 per employee is intended to capture the fully loaded employee cost typical for a technology company that is tightly managed which includes healthcare, vacation, HR costs, office space, etc. It’s easy to go much higher than this with lack oversight. 80 of the employees are sales people who likely have a smaller base and are receive substantial compensation via sales commission. If you liked this post, see our previous TC Teardown: Chegg Is A Money Machine.